A scholar, tasked to copy a sutra, meets with a mysterious old lady and her daughter in the mountains. The film has been recently restored and has been playing around the USA. NYTimes: "Filled with lovely natural landscapes that have been meticulously framed and photographed, “Legend of the Mountain” is often a visual ravishment." 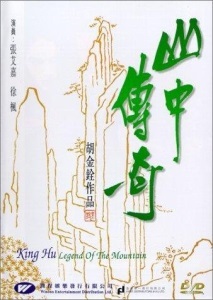 Film Journal: "What Hu's earlier films did for wuxia, Legend of the Mountain did for the supernatural, and its influence can still be felt in Hong Kong's hopping vampire and ghost stories." Yes, it's a ghost story, but not spooky ghosts, more like unfinished-business ghosts (who also thirst for the power contained in the sutra). Features two extended literal drum battles between a well-dressed lama and the main ghost/demon. Gah. One of those (1979)'s wasn't there in the preview. I saw this yesterday at NW Film Forum in Seattle (playing twice today if you're local!) and wanted to see if anyone else caught it. I'm going to share a few non-spoilery thoughts and come back later with my "what the hell was going on" questions. First, a couple of warnings - the movie is both long and LOUD. The soundtrack, while beautiful, features lots of flute-playing which is mixed louder than the dialogue. The volume was a bit too high when I saw it but the flute is pretty ear-splitting anyway. The drum battles are great, though, especially the first one when the lama is investigating and Melody is trying to drive him away. It was a much more interesting way of doing "magic beings have a magic battle using magic" than the later smoke-bomb stuff. Also great: everybody gets perfect period costumes except for Old Zhang, who has a ratty robe and some dime-store vampire teeth. And he's not even a vampire. Not as great: the length - other than the initial trek through the countryside, every scene could have been about two-thirds as long without losing anything. I came out of the theater not liking it very much, primarily because of that, but it's really grown on me overnight.